Prepare yourself for the most realistic hunting experience ever! Travel throughout the United States, Canada and exotic Zambia to lock your sights on the prey of a lifetime. Unique action-packed missions will get your quarry running and your heart pumping. Track the quarry of your choice- White-tailed Deer, Mule Deer, Pronghorn, Buffalo, Elk, Grizzly, Moose, Mountain Goat, Mountain Lion and Wild Boar. This game test your memory, and, ultimately, your sanity. The object of the game is to memorize sequence of lights. On that note, does anyone remember those Simon commercials in the '80s? How could you forget! :). Use your mouse to click start and click the color bars. Memorize the colors.You can do it! Yummy Puzzle is a fun and easy puzzle game. Bright eye-catching graphics, excellent music and simple mouse control. The more you play the more you want to play. Gameplay is fun for adults and kids. This game will start on most PC's. 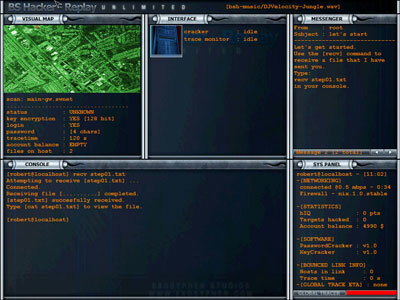 BS Hacker is a unique hacking simulation game. You enter the underground world and play the role of a hacker, working against a system that aims to control everything. A complete hacker console and interface will create a perfect hacker environment, while the realism of the game elements will make you wonder if this is real ... or just a game. BS Hacker Replay - Unlimited contains 23 levels divided into five episodes. This is a 3d slot machine made with OpenGL and C++. Serpengo is an addictive action puzzle game, where you create a serpent out of exploding balls. It includes brilliant 3D graphics and original gameplay. Arcade Mode lets you compete against yourself. Run into the colored balls and your serpent will grow. Get three of the same color balls in a row, and they will explode. Puzzle Mode allows you to solve a series of increasingly intricate puzzles. If you are a puzzle master, this mode is for you. This game draw colur box and you memorize (try to use eidetic memory) them. Sounds easy? An eclectic collection of games to pass the time and challenge the mind. Mindgames is composed of card, board and miscellaneous games that are primarily puzzle based and varied in objective. Highlights include a Sudoku puzzle solver and creator, unique crossword creators such as Xword, Chainmesh and Diamonds, challenging board games such as Abalone, Conquer, MutoReRe and LLS, interesting card games such as Mendicot and 8off, and more! Scorch an Island - an addictive multiplayer tank game, based on the idea of Scorched Earth. The gameplay is simple - choose weapon, set angle, power and fire! The more distant the shoot is, the more points you score. The goal is to destroy all the competing tanks and get as much points as possible. Online maze. Find all priz. Online labyrinth. Find all priz.